The first U.S. troops arrived in Great Britain in January 1942, only a few weeks after Pearl Harbor, and in the following month the U.S. and the United Kingdom signed a Mutual Aid Agreement formalizing their military alliance. It would be nearly a year, however, before American soldiers saw ground action. The early U.S. contribution was more significant in the air; in May 1942, American planes backed up the Royal Air Force offensive launched against Germany and subsequently commenced their own raids on the 4th of July. On land, after considerable debate, the Allies agreed that they would were not ready to launch a direct assault on the German positions in Europe, but would first attack the Nazis under General Erwin Rommel in North Africa. American troops landed in November 1942 to support the British 8th Army under Field Marshall Bernard Montgomery, who had had defeated Rommel at El Alamein. As part of the planning, General Dwight D. Eisenhower was named as Commander in Chief of the Allied Forces, a position he would continue to hold throughout the war. The decision to engage the Germans in 1942 was partly due to political considerations of President Roosevelt, who believed he could not wait longer to show the public that Americans were taking the offensive against the Nazis, as well as competition within the armed forces for the allocation of resources. 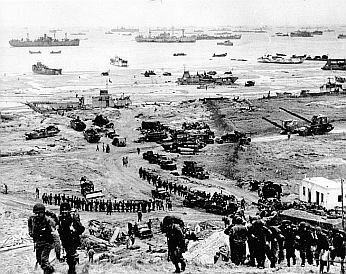 At the same time, American commanders in the Pacific were urging redeployment of the men and equipment massing in Europe. Unless Eisenhower made some use of that military power soon, Marshall expected that General MacArthur and the Navy would argue for shifting more troops, weapons and supplies to their commands. Reflecting longstanding British concern for the Mediterranean, Prime Minister Churchill strongly supported a North African campaign as one component of a peripheral strategy to tighten the ring around Germany. Bowing to the inevitable, Marshall at last selected a North African assault as the best option of those he had available. In January 1943, President Roosevelt and Prime Minister Churchill and their top military officials met in Morocco for 10 days at the Casablanca Conference that ended with a joint declaration that the allies demanded unconditional surrender of the Axis states--a condition later criticized for potentially prolonging the war by undermining the German opposition to Hitler. At Casablanca, the military also agreed to a plan to complement the British night bombing campaign against the Germans with American bombers conducting daylight bombing, which allowed more precise attacks but risked higher losses. Shortly after the end of the Casablanca meeting, the Germans surrendered to the Russians on February 2, 1943, after costly fighting in the Battle of Stalingrad, with the loss of over 200,000 German troops, 1,800 artillery pieces and more than ten thousand vehicles. After American troops in North Africa were badly defeated in the Battle of the Kasserine Pass, General George S. Patton was named by General Eisenhower to take charge of the 2nd Corps, which had been beaten at Kasserine by the Germans. Patton imposed strict training and discipline, and in March 1943 launched with the British a successful counter-offensive leading to the German surrender of their North African forces in May 1943. The leaders at the Casablanca Conference also had agreed on the Italian island of Sicily as their next target after the completion of the campaign in North Africa. In July, Patton and Montgomery succeeded in the invasion of Sicily, defeating the Germans in a 38-day long campaign. On Sicily, however, Patton provoked calls for his dismissal when he slapped two soldiers hospitalized for battle fatigue, accusing them of cowardice. In order to save his command, Patton was forced by Eisenhower to apologize publicly to both men and to his troops. The long-planned invasion of France commenced on "D-Day," June 6, 1944, with the landing on the beaches of Normandy of an invasion force of 4,000 ships, 11,000 planes, and nearly three million soldiers, marines, airmen, and sailors. About 4,900 U.S. troops were killed on D-Day, but 155,000 Allied troops were ashore by day's end and in control of 80 square miles of the French coast. They then proceeded to drive the Germans inland from their coastal positions. Paris was liberated on the night of August 24-25, 1944, by the U.S. 4th Infantry Division and the French 2nd Armored Division under General Charles de Gaulle. German General Dietrich von Choltitz, commander of the German troops, disobeyed Hitler's orders to destroy the city prior to its fall to the Allies. In the afternoon, von Choltitz signed the surrender while General de Gaulle set up the seat of the Provisional Government of the French Republic at the War Ministry. At seven p.m., de Gaulle gave a famous speech from the balcony of the Hôtel de Ville: "Paris insulted! Paris martyred! But Paris liberated!". The Allied advances on the West, coupled with the Russians pressing forward on the East, pushed the Germans closer to their borders. In December 1944, however, Hitler launched a surprise counter-offensive in Belgium in an attempt to drive a wedge between the American and British armies and advance to the sea at the English Channel. The initial attack in the Battle of the Bulge led to heavy Allied losses and an eight-day retreat. The German advance stalled, however, when gasoline supplies for its tanks, trucks and other vehicles were depleted, and the Allied armies regrouped and soon had the Germans falling back. With declining manpower, armament and supplies, the Germans would not be able to initiate another major offensive for the duration of the war. 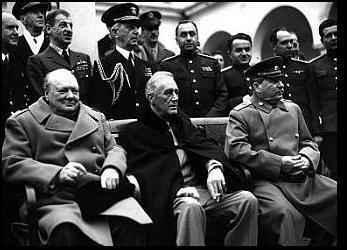 In February, Roosevelt, Churchill and Stalin met at the Yalta Conference in the Crimea of the Soviet Union. The agreement they reached set the outline for post-War Europe, and led to the division of Germany and, ultimately, the Cold War. The deteriorating health of Roosevelt apparent at Yalta has long provoked speculation over whether it played a part in the failure of the negotiations with Stalin to force a Soviet withdrawal from the areas they had seized in Eastern Europe. In mid-February 1945, the Allies bombed Dresden, killing over 100,000 civilians, partly at the urging of Churchill to retaliate for those lost in the Nazi bombing of London.